In total, nearly 400 manatees are believed to have died from this lingering event, shattering the previous record of 56 cold-related deaths. Through December 31st, 767 manatees have been confirmed dead in the state of Florida, representing more than 13% of the species’ estimated minimum population. This far surpasses the record of 429 deaths set in 2009. Although 2010 started with ideal conditions that allowed a record number of manatees to be counted during the annual aerial survey (5,076), the same cold weather that facilitated the count began causing unprecedented levels of mortality in the subsequent weeks and was followed by another unusually cold weather period in December. In total, nearly 400 manatees are believed to have died from this lingering event, shattering the previous record of 56 cold-related deaths. In addition, several dozen manatees suffering from cold stress were rescued around the state. Although cold-related deaths are considered a natural cause, the events of this winter highlight the vulnerability of our state’s manatee population, and reinforce the importance of safeguarding winter habitat and minimizing human-related threats to this species. Florida’s springs provide natural winter habitat for endangered manatees. Reduced spring flows caused by increased human demand for water have decreased available habitat at some of our springs, while access to other springs has been reduced or eliminated by weirs or dams. Residents and visitors of Florida can decrease their water usage to protect water resources for wildlife, as well as for our own needs. For manatees, the highest levels of mortality last winter were experienced in the Everglades. 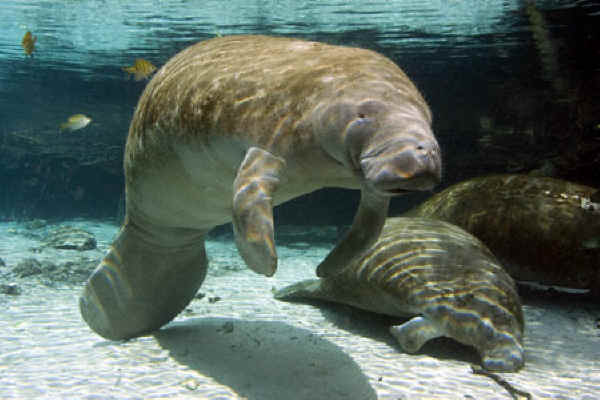 Historically, warm groundwater would exit the aquifer through seeps and small springs and provide a refuge to manatees in the Everglades during the winter months. However, extensive development and canal dredging have altered the flow of water over the last 100 years, decreasing the availability of these seeps and springs, and leaving manatees at risk. As spring arrived and Florida’s coastal waters warmed, manatees began falling victim to watercraft strikes. Through December 31st, there have been 83 manatee watercraft deaths, compared to 90 during the same time frame in 2009. The boating community has a crucial role to play in ensuring that the number of manatee mortalities is minimized. In addition to obeying speed zones, traveling in deeper water and wearing polarized sunglasses to better see manatees, boaters are often the first to see manatees in distress, and their timely reporting to the Florida Fish and Wildlife Conservation Commission can save a manatee’s life. Boaters who see an injured, dead, tagged or orphaned manatee, or a manatee who is being harassed, are asked to call the FWC hotline number at 1-888-404-FWCC (3922) or #FWC or *FWC on cellular phones, or use VHF Channel 16 on marine radios. SMC’s free boating banners and decals are useful tools to help protect manatees (see information on obtaining them below). With the losses the manatee population has already suffered this year, it is more crucial than ever that watercraft-related injuries and mortalities be minimized during the remainder of the year. During the spring and summer of 2010, the manatee conservation community braced for possible impacts related to the tragic oil spill in the Gulf of Mexico, caused by the explosion of the Deepwater Horizon. We know that birds and sea turtles are among the species that directly fell victim to the oil, but we are still unsure of the long-term damage to the food web and our coastal habitats. While manatees appear to have avoided major direct impacts from the oil that would lead to their rescue or death, only time will tell what long-lasting damage was done to their home, including seagrass beds and other submerged resources. With winter approaching, the public's help is also needed to report sightings of manatees outside Florida, because this subtropical species cannot tolerate prolonged exposure to water temperatures below 68° F. As the waters cool, residents living outside Florida, along the Eastern Seaboard and Gulf of Mexico are reminded to watch for manatees and immediately report any sightings to their local wildlife officials or marine law enforcement office. Contact information is available at: www.nmfs.noaa.gov/pr/health/networks.htm. Members of the public should be prepared to report the number of manatees observed; the physical location of the manatees, with reference to any nearby landmarks; and a general description of the size and behavior of the manatee. Also, photos of the manatees, particularly clear photos of any scars or injuries help biologists identify individual manatees. The public should not provide food or water to manatees, as this may encourage them to linger instead of swimming home to Florida.